Welcome to DAY 5 snd the final day of the Impression Obsession Stamps Spring 2018 Blog Hop! What a feast for the eyes this week! Today, I'm sharing a fun card using the Puddle Jumper Stamp. Isn't it simply delicious?? I love the smell in the air when the rain is falling. It is so cleansing. Have you ever stood in the rain on a warm day, feeling the cool rain fall on your shoulders? What a wonderful feeling!!! This cute little fellow is making the most of the rain by jumping in the puddles! It's kind of like making lemonade when life gives you lemons or looking at problems as opportunities for positive change and growth. It's all a matter of perception. The way you interpret something can have a huge impact upon how it will affect you. For instance you can feel bad that it's raining, complain about having to use an umbrella and mope around on that grey day. Alternately, you can take Joy in the fact that Mother Earth is replenishing our water sources, and nourishing our vegetation . Keeping that glass is half full attitude will go a long way in allowing you to have some contentment in your life. I say Jump in those puddles! 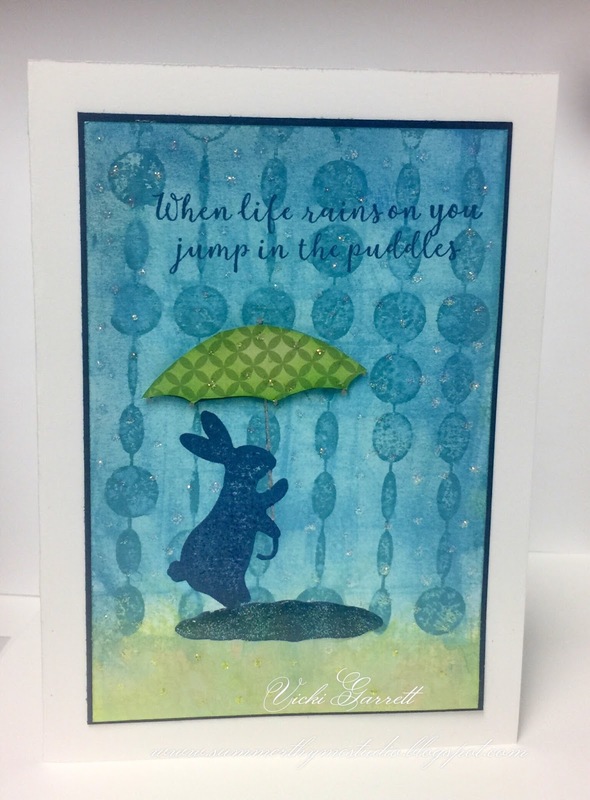 I created the blue and green background using Tim Holtz distress inks and the Party Beads CAC background stamp. I stamped the main image with IO Ink in Navy Blue. I wanted to paper piece the umbrellas for a little bit of contrast and mount it on dimensionals to pop it off the paper a bit. Lastly, I added some glaze and glitter to the puddle and some stickles rain drops! Hope you enjoy my funny bunny! 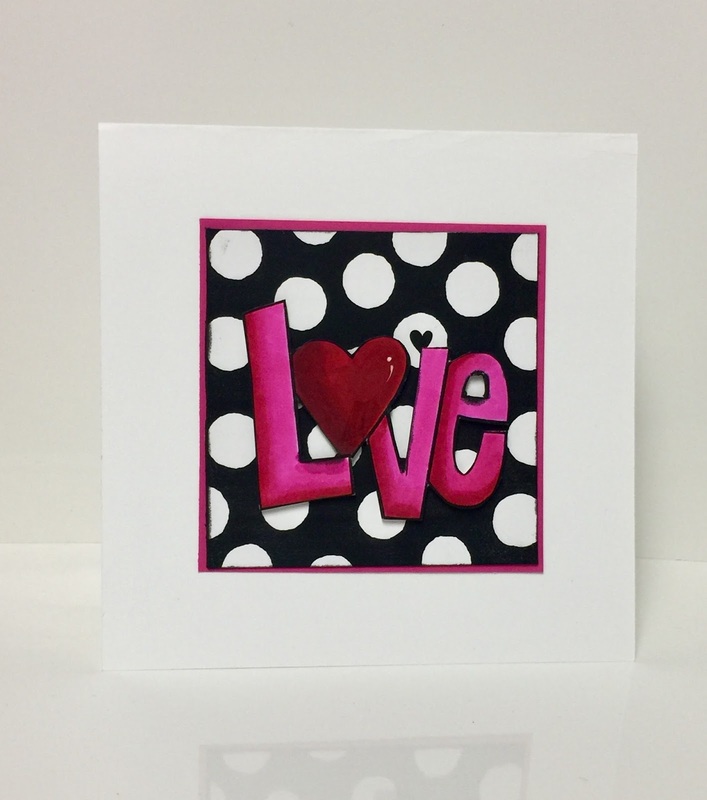 Don't forget to leave some love and you could win a $25.00 gift certificate. 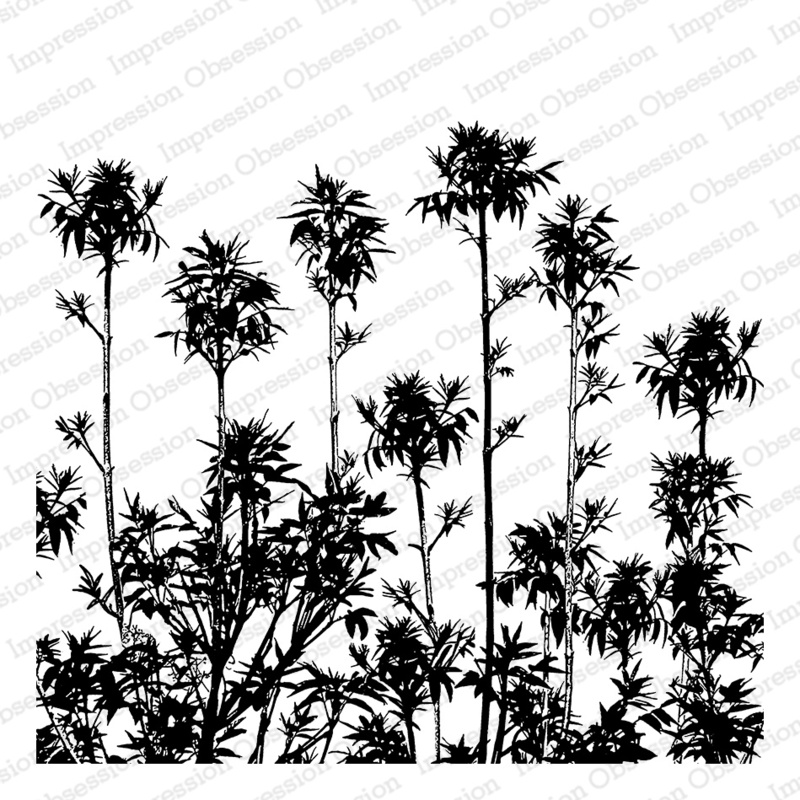 Welcome to Day 3 of the Impression Obsession Spring Release Blog Hop. Today I'm sharing my first page, which is a warm up assignment for a year long art course i'm taking online called LifeBook 2018 at Willowing Arts. This particular lesson was designed by the founder of Lifebook Tamara Laporte. I am such a fan of her whimsical artwork. In the last few years I have dealt with many health and emotional challenges and have worked hard to get a handle on many aspects on my life. My Art has been integral in allowing me to maintain my sanity through all of this mayhem. I believe there is always a silver lining in each and every cloud. These challenges have allowed me to reacquaint myself with my spirituality and the principles by which I wish to live my life. I truly feel I am on my healing journey and engaged in exploration of me, my inner child and higher self. The Butterflies represent the fluidity of my growth as well as the metamorphosis of my spirit. I am excited to be embarking on this self exploration journey through art, meditation and self care. 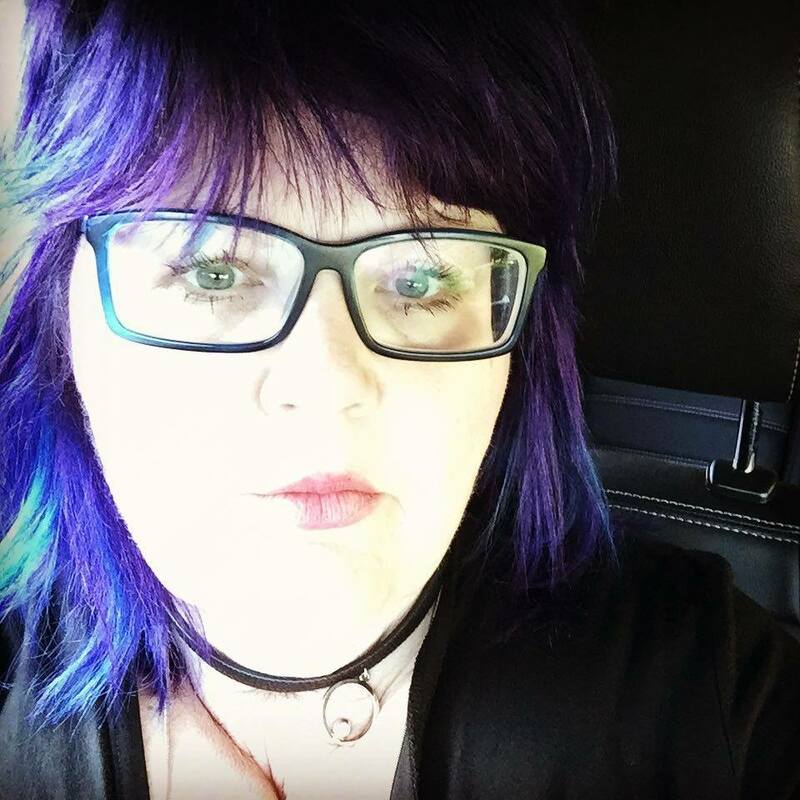 You'll find my blog is going to become a little more personal as I am so excited about sharing my journey with you as a means of a diary of sorts and a source of inspiration for others. I took the liberty of using some of the new release stamps in the creation of this warm up page. The words Journey and Exploration come from the latest Journal Jargon 3 set by Seth Apter. I love the selection of stamps he has designed exclusively for Impression Obsession. I am a HUGE fan of his Artwork! 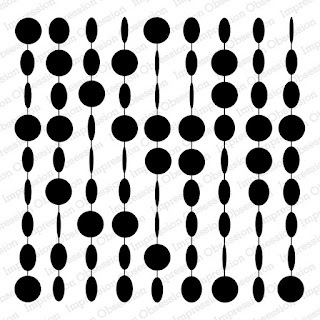 Can you spot either set in there? 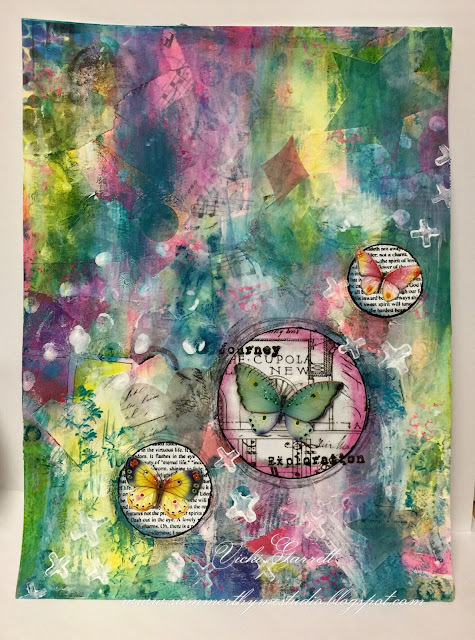 I also couldn't find any small text paper (the circles under the two smaller butterflies) so I used Beauty Text to create my own. Don't forget to leave some love for a chance to win a gift certificate! If you like my page and might be interested in this beautiful course, follow the link below to learn more about it! If you weren't here yesterday, scroll down to see my post, which gives you all the details with regard to the great giveaways we have for you this week and how to take part!!!! I coloured sweet Ms. Bun Bun with Copic Markers. 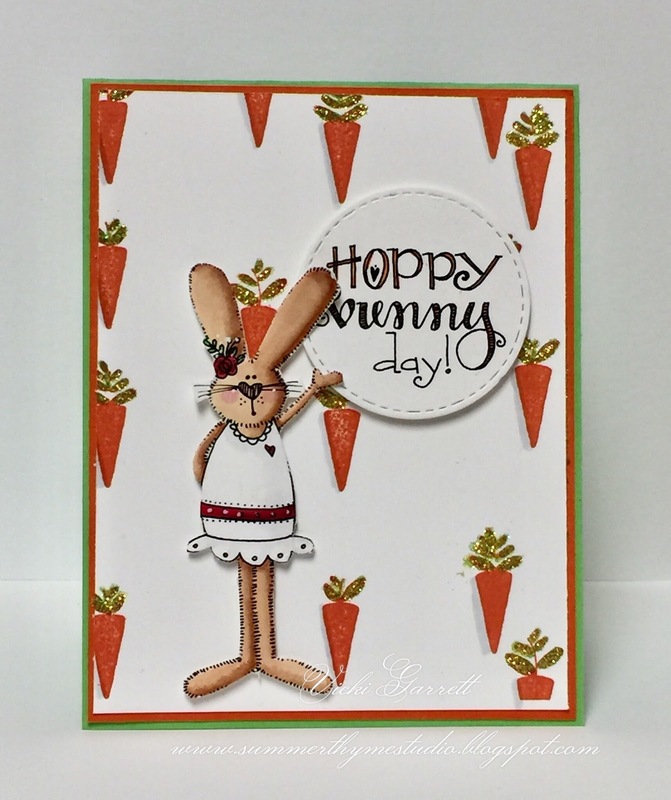 To make the background, I stamped the Carrot Medley CAC stamp in orange. I then coloured the stems with a green copic marker and added some shading in C1 to the left of each carrot. I added a little glitter 'cause you know I LOVE pizzazle! 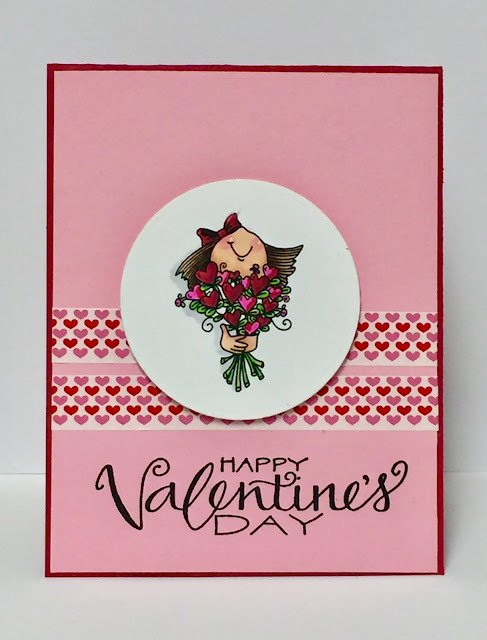 Lastly, I stamped and cute the sentiment and popped it up using some foam dimensionals. I really like the way this card turned out! Sooooo we have lots to share with you today! Be sure to visit the following blogs and leave some love. I hope you had a most amazing holiday and are looking forward to an amazing year!!!! I am SO looking forward to accomplishing a lot this year, including more blogging!!!! This year, I intend to Love myself and those around me!!! Although it seems a Valentine, I created this card for me! To remind myself of Love, Happiness and Light emerges from within. Rather than spending endless hours in search of these qualities I can find them, if I only I look inward. The challenge this week is to create something with shine. I did add a little wink of Stella to my main image, but what I really want to shine this year is my attitude. You may see more musings from me this year as I find myself on a different path from whence I've been travelling for the last decade. It feels good to return to a Road less travelled and I'm so excited about where this journey will take me and the discoveries I shall make along the way. Blessings for a Most AMAZING year!